Willians Astudillo is a fan favorite and is finally getting his cardboard due after a 9 year minor league odyssey. 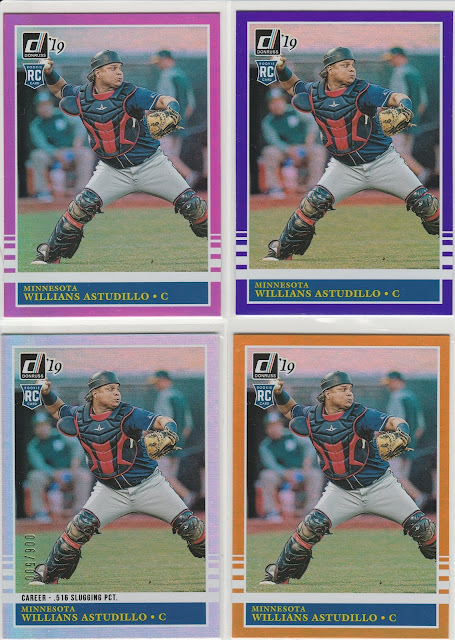 Today, let's look at Panini's contribution to the Willians Astudillo oeuvre. The back is a simple statement of the facts. 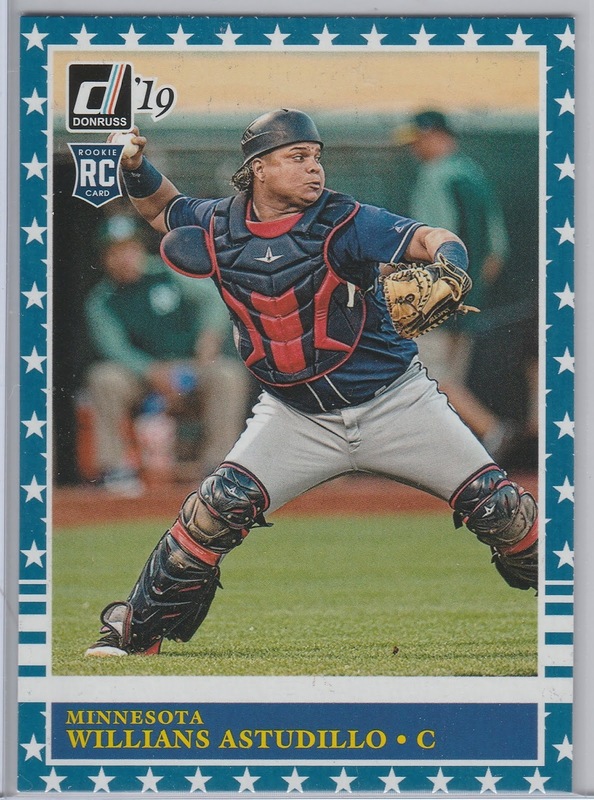 Astudillo has slumped a bit, and his career batting average has dropped to .342. Astudillo didn't make it into the exclusive Donruss Optic checklist, but he still gets a nice variety of shiny cards, these refractor-ish cards are called "Holo" parallels. Pink, Purple, and Gold. 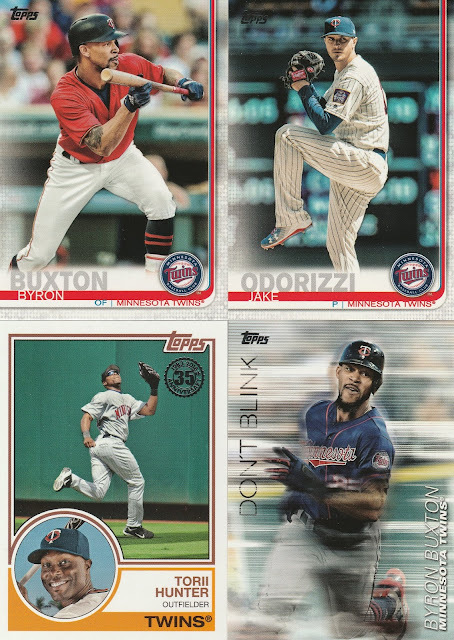 Panini is using the MLB promotional holidays as parallels as well. This one is for Independence Day, there's also Mother's Day, Father's Day, and Jackie Robinson Day. It's the 150th Anniversary of... 1869. This is the "official" anniversary of professional baseball, and this year is the big 'ol Sesquicentennial. Big Whoop! Last but not least, they made the back shiny for this parallel, numbered to 99 copies. 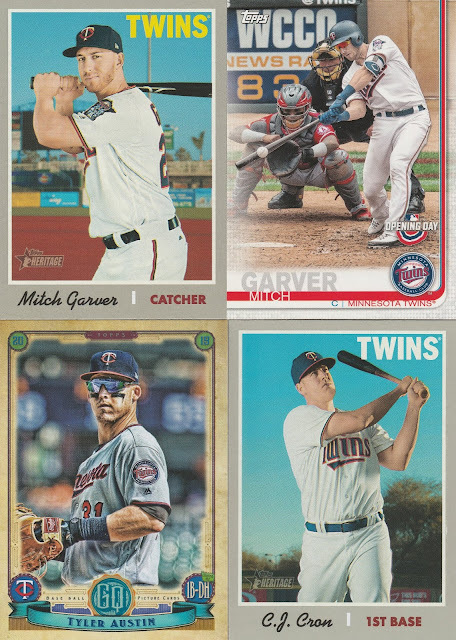 Hit me up if you have any of the parallels not shown here from 2019 Donruss, I'd be interested! Like his teammate Tim Salmon, J.T. 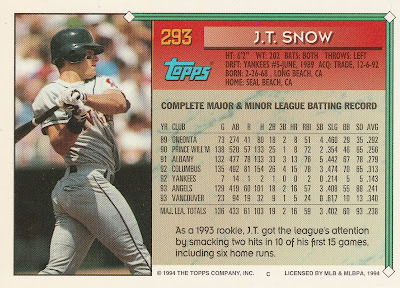 Snow was a SoCal kid finding his way in the big leagues close to home. Snow is the son of Rams Wide Receiver Jack Snow , and the younger Snow followed in his athletic footsteps. Snow was a 3 sport athlete in high school; the starting QB for the football team, point guard on the basketball team, and slugging first baseman for the baseball team. 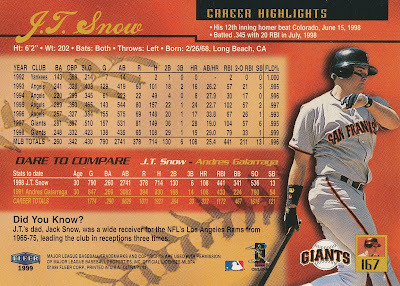 Snow's candidacy for the Topps All-Star Rookie squad was fueled by his defense as well as his still developing power bat. He probably reminded more than a few Angels fans of Wally Joyner, who had been the 1986 Topps All-Star Rookie at first base. Snow didn't set the world on fire quite like Wally did, sharing the spotlight with a wide range of young talented players in SoCal, but he hit 16 homers in his rookie season, 6 of which came in his first 15 games. While he didn't keep that pace up for the rest of his rookie campaign, there were plenty of signs that he would be a star for years to come. Snow made his way to California by way of Yankee stadium. He was originally drafted out of the University of Arizona by the Yankees in the 5th Round of the 1989 draft. In College, he counted Trevor Hoffman, Scott Erickson, Kenny Lofton, and Alan Zinter among his teammates. 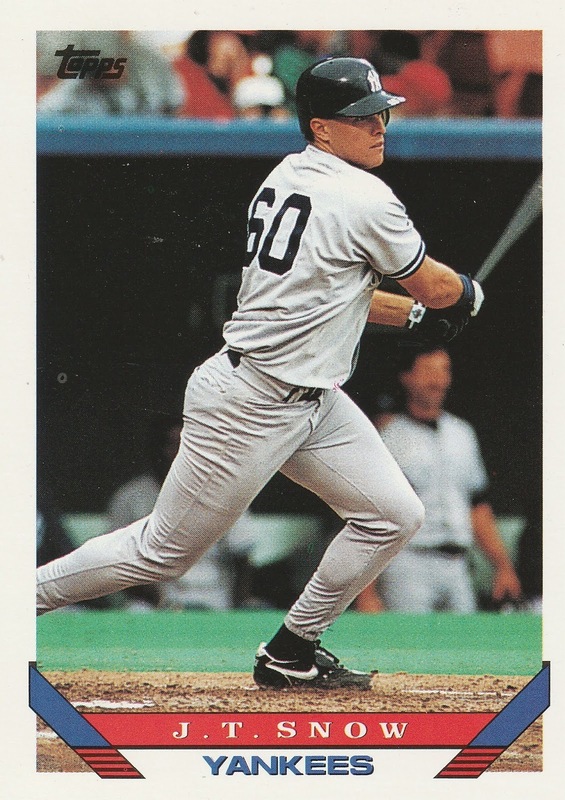 He made quick work of the Yankees' farm system, earning his MLB debut in September of 1992. He showed power in the minors, with double digits in homers in his last two seasons. The Yankees, of course, already had a pretty good first baseman in Don Mattingly, so it should not have been a big surprise that Snow would be dangled in trade offers. 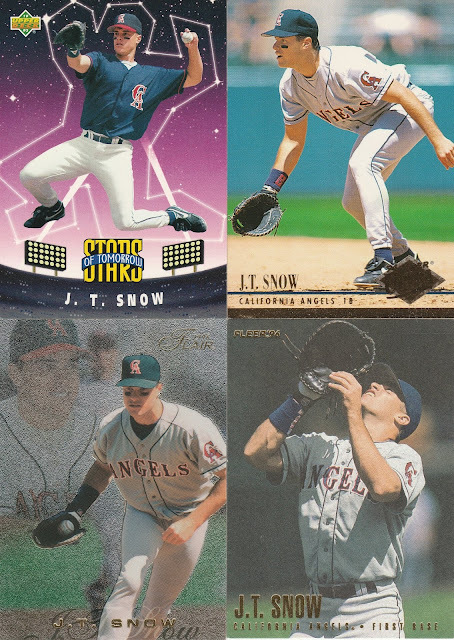 The Angels decided to part with Jim Abbott because the Yankees included Snow along with Russ Springer and lefty Jerry Nielson. 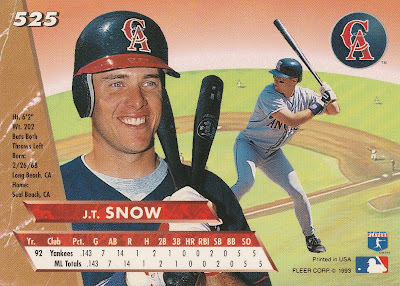 While the pitchers did not provide much value to the Angels, Snow would be a franchise cornerstone. It didn't start out as a rosy relationship with Angels fans, however. They were die-hard Jim Abbott defenders, and could not see the potential of Snow outweighing the front line starter that Abbott had already proven to be. Snow's dad now was a radio talk show host in SoCal, and it got the the point where the younger Snow couldn't even listen to the radio. As the New York Times chronicles, Snow was right in the midst of his early 1993 power surge, and he credited the skeptics and the critics for fueling his fire. Even more juicy was this tidbit from 1994 - Snow was nearly headed back east in Spring Training to the Mets in exchange for Anthony Young! You won't find many cards showing J.T. at the plate - he was actually a very good hitter with power to the gaps, but his glove was something special. 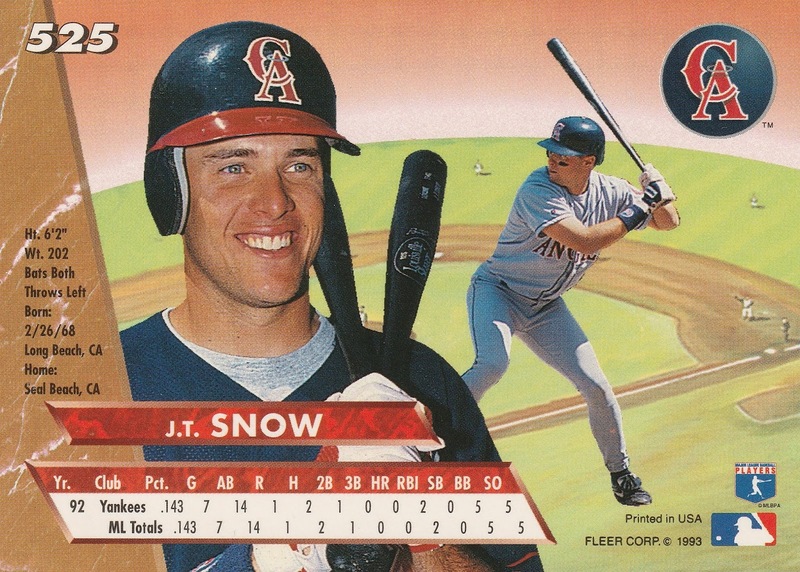 In his California Angels days, Snow would win a pair of Gold Glove awards, with just 22 errors over the 4 seasons. 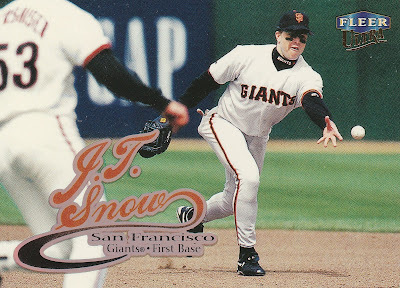 Coming to the Giants in a trade in 1997, Snow was even better in the field, and had a career year at the plate as well. He had a career high 28 homers and drove in over 100 runs for San Francisco, and made his first trip to the post season. 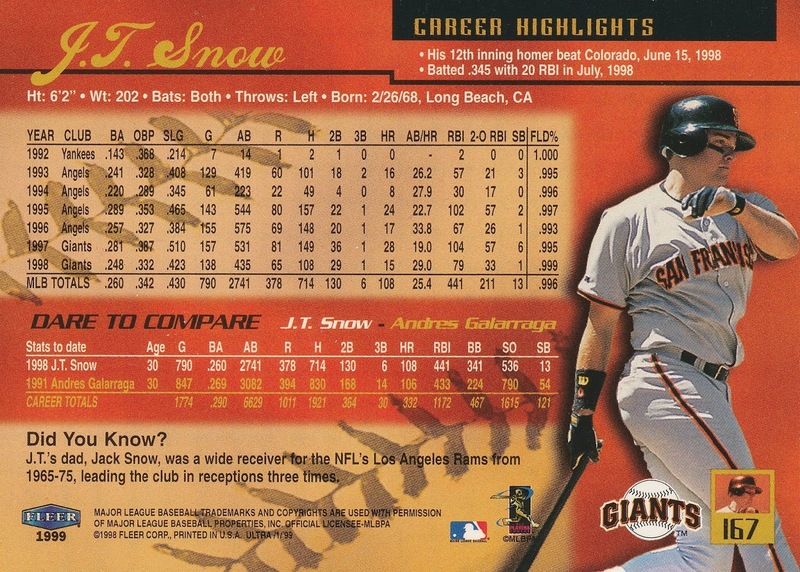 Snow's first year in San Francisco was so good that he was being compared to Andres Galarraga, when in all honesty he was more of a Pete O'Brien at the plate (not necessarily a bad thing!). Snow would win 4 more Gold Gloves with the Giants, and after a season with the Red Sox in which he played just 38 games, he came back to the Bay Area to retire as a Giant. His career fielding pct ranks 16th All-Time among first basemen. One of the fun things about a completed set is deciding how you want to organize it. 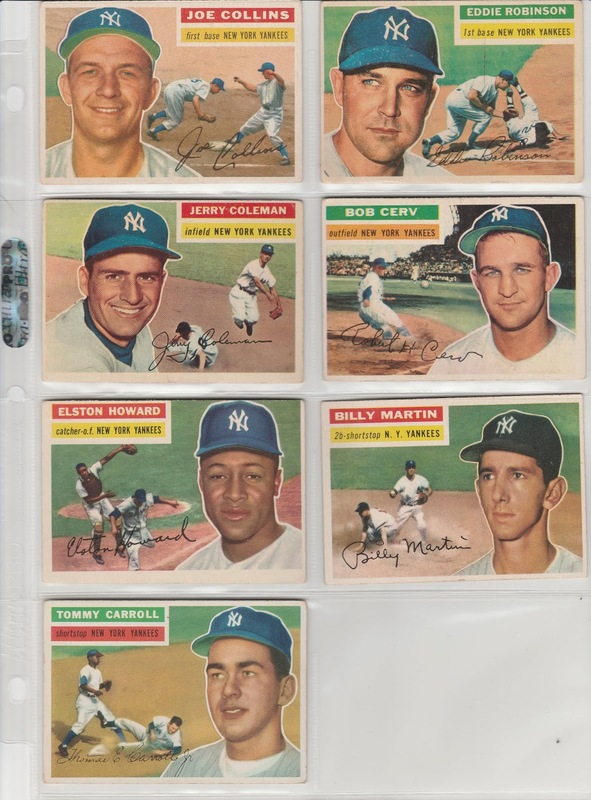 I have the 1956 Topps set in a binder, sorted by team, in the same order that the teams finished in the 1955 Standings. 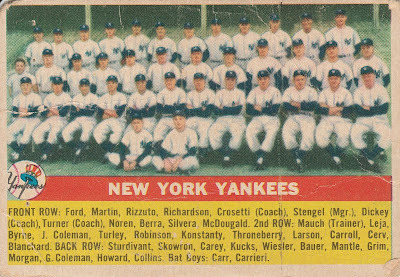 In 1955, the New York Yankees were the American League champions, with a 96-58 record. They would lose the World Series in seven games. While the AL Champions did not win the 1955 series, they would not have to wait long to return to the Championship -- it would be the first of 4 straight World Series appearances, winning in 1956 and 1958. 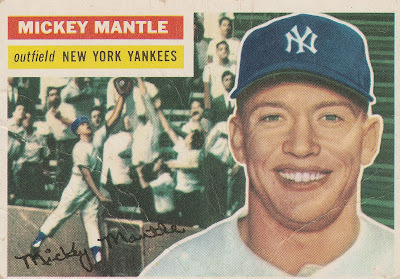 The Yankees' best hitter in 1955 was the great Mickey Mantle, who was just 23 years old and the toast of the town, He led the league with a ridiculous 180 OPS+, playing a superb center field while getting on base with a league leading .431 OBP. 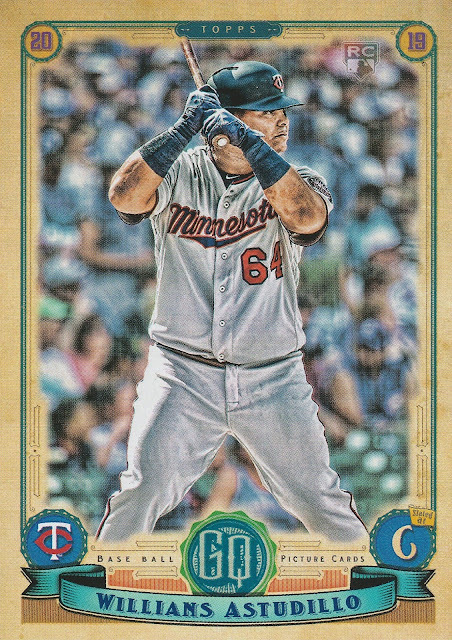 He hit .306 with 37 homers, and scored 121 runs. 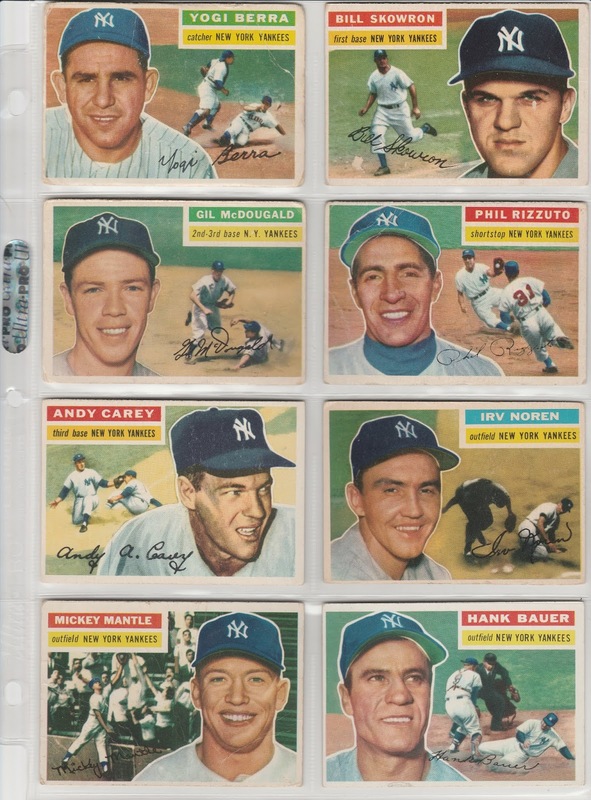 While the 1955 season was impressive, it didn't hold a candle to 1956. 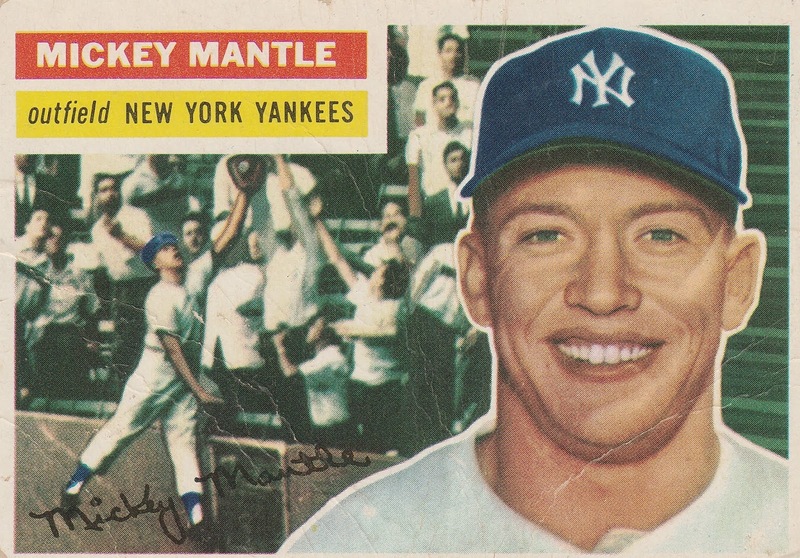 Mantle would win the triple crown, hitting .353 with 52 homers and 130 RBI. He scored 132 runs and his OPS+ was 210, meaning his season was 110% better than the average Major League outfielder. He'd win 3 MVP awards over his career. 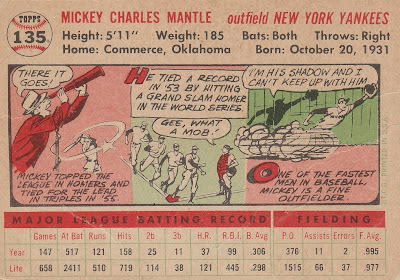 The well-known and well-traveled narrative is that injuries would rob Mantle of his full potential, and certainly it directly changed the 1955 Series. 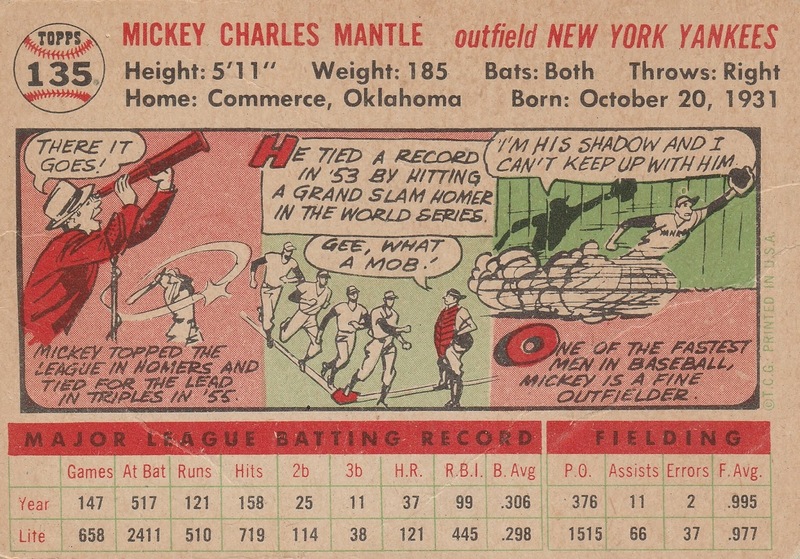 Mantle played in just 3 of the 7 games, and had just 2 hits in 10 at bats. For his career, the Hall of Fame, Switch hitting Center Fielder would still hit 536 homers, and have over 1500 RBI despite chronic knee and back pain. The Yankees' best pitcher shared a nickname -- The Chairman of the Board -- with Sinatra, and the lefty made his teammates sing his praises throughout his career. 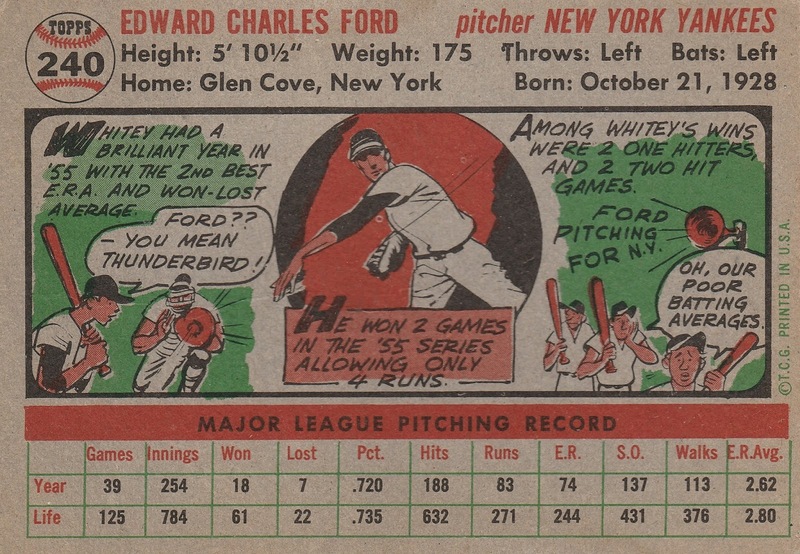 In 1955, Ford had a 18-7 record with a 2.62 ERA. While his 137 strikeouts in 254 innings is not eye popping by today's standards, it was among the league leaders in '55. He hurled 5 shutouts that year, and was the staff ace all season long. His 18 wins (and 18 complete games) led the AL. 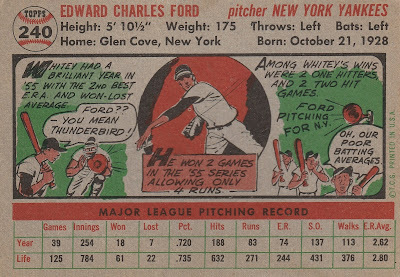 For his career, Ford had a 236 - 106 record. His 45 shutouts ranks 29th All-Time. 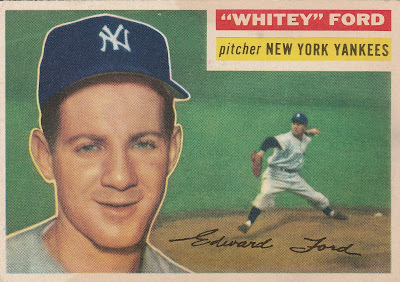 His best season was 1961, while Maris and Mantle were chasing Babe Ruth, so too was Whitey Ford, but as a pitcher. Ruth's World Series scoreless innings streak was 29 and 2/3 innings, and Ford matched then beat it en route to a World Series MVP award. During the '61 regular season, he won 25 games and his only Cy Young Award. Casey Stengel, Yankees' irascible manager, was quoted often for his humor, but he also said -- "I never play a game without my man." That man was Yogi Berra. 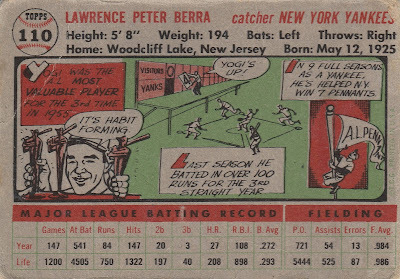 Berra led the Yankees on the field, and in 1955 had a team high 108 RBI, while hitting 27 homers. Oh yeah, and he was the AL MVP for the second consecutive season. 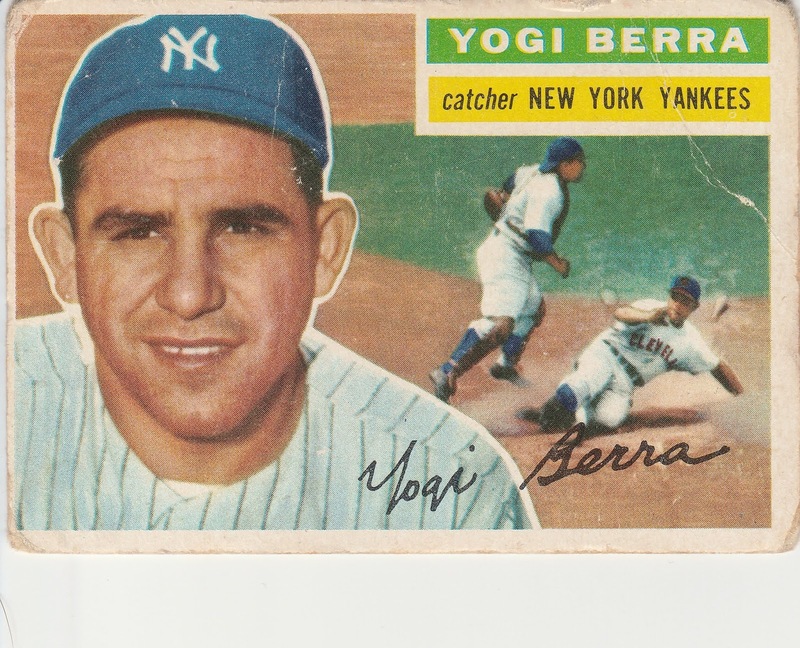 Berra is a 10 time World Champ, 18 time All-Star, 3 time MVP. 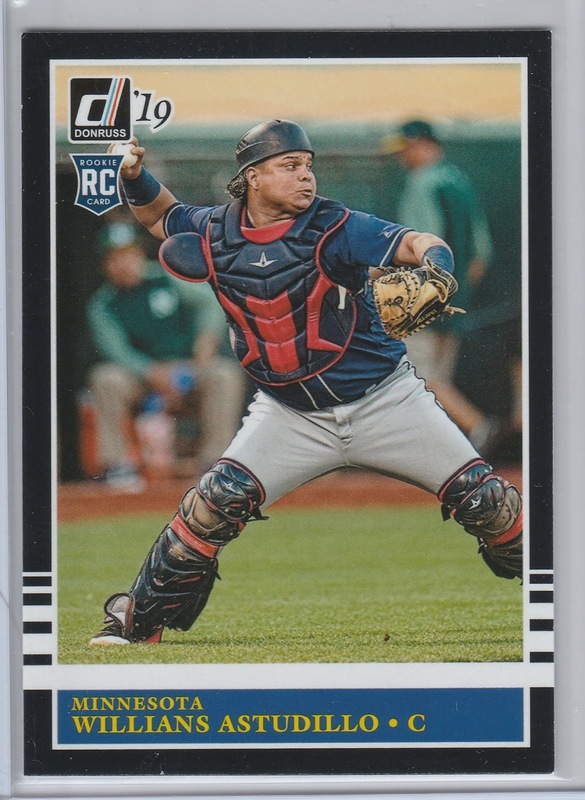 As a catcher, Berra never led the league in a single offensive category, but his value was measured as much for his baseball knowledge and on-field leadership. 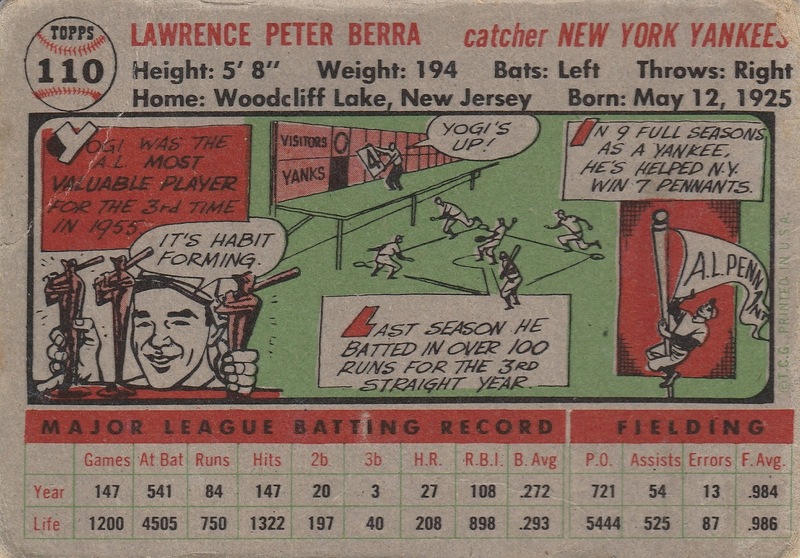 It didn't hurt with sportswriters that he was always ready with a goofy quip, but Yogi was a tremendous baseball player regardless of his funny quotes. 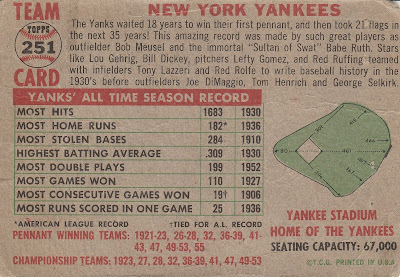 Phil Rizzuto was at the tail end of his Hall of Fame career, and 81 games in 1955, he drove in just 9 runs. Of course, Rizzuto was never known for being a great hitter, but the production had slipped to a point at which he was supplanted at Shortstop by former Oriole Billy Hunter in 1955, and by Gil McDougald in 1956. McDougald was in many ways a forgotten star in the Yankees dynasty. In 1955, he was the Yankees' primary 2nd Baseman hitting 13 homers for the Bronx Bombers. 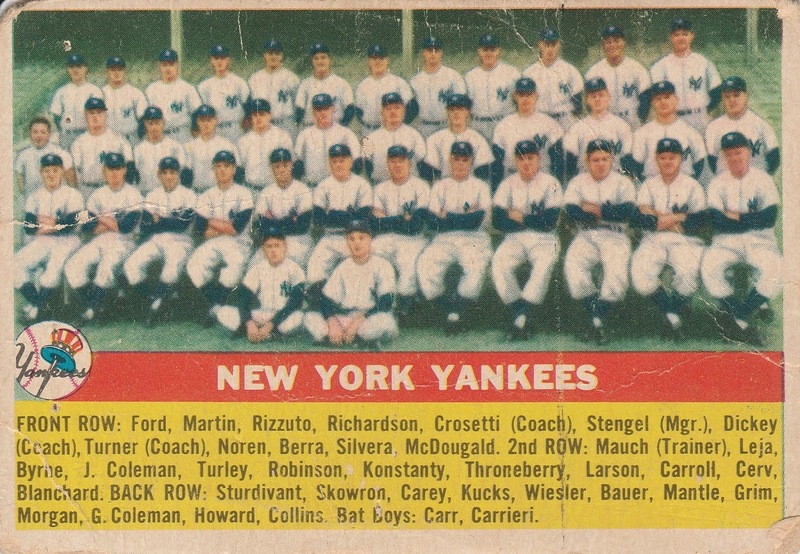 Mantle and Berra were joined by Bill "Moose" Skowron and Hank Bauer as power bats on the '55 team. Skowron had an OPS+ of 140, hitting a team high .319 - Bauer crushed 20 homers. 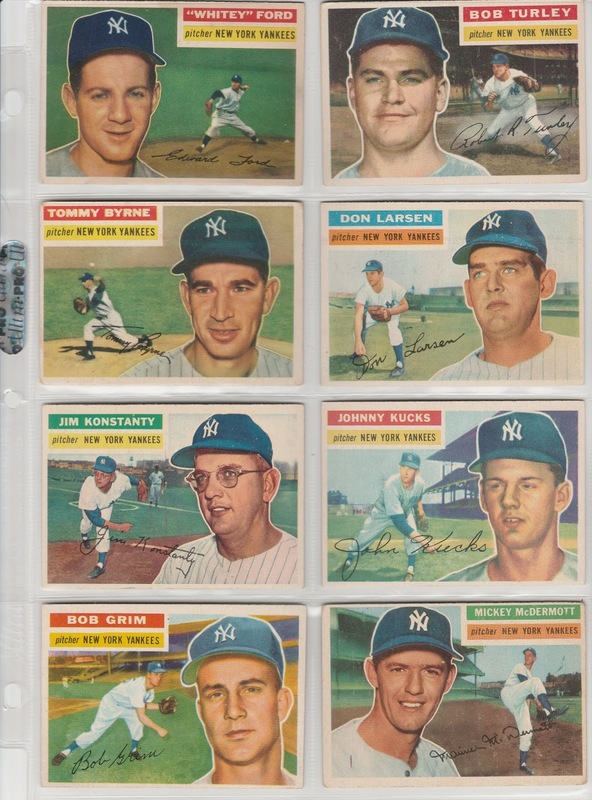 Ford was the best Yankees pitcher, but their #2 starter Bob Turley wasn't far behind. In fact, Turley struck out 210 batters and had a team high 6 shutouts. Jim Konstanty was a stabilizing force in the bullpen, saving 11 games but finishing 30 games overall with a sterling 2.32 ERA. Don Larsen was just 25, still a year award from the perfect game in the 1956 World Series that made him a baseball immortal. Even the Yankees' bench was stacked - with the great Elston Howard waiting in the wings to provide relief for Yogi Berra behind the plate. 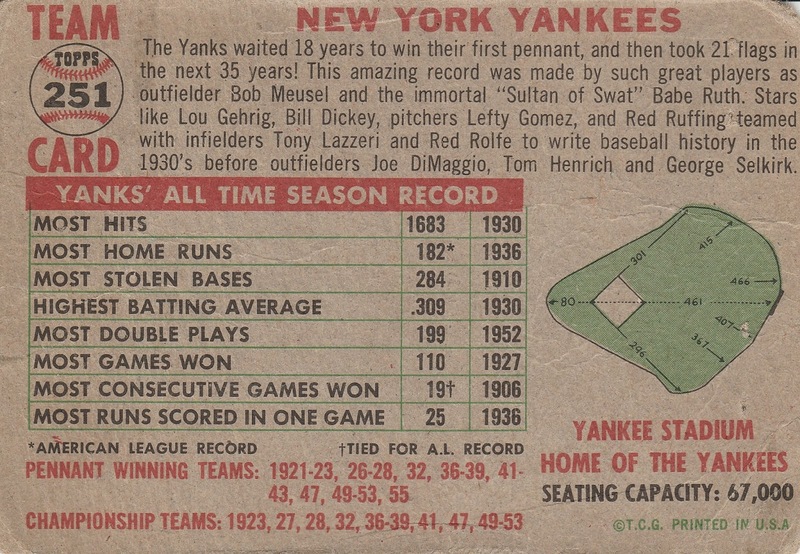 Billy Martin would once again become the Yankees' starting second baseman in 1956 and was already a fixture in Yankees' lore. A host of veterans like Eddie Robinson who hit 16 homers off the bench in 1955, and Jerry Coleman provided sage leadership. In addition to buying some cards at Saturday's card show, I also met up with Jim from cards as i see them at one the vintage vendor's tables. He'd already been at the show for over an hour, so it was short but sweet, and as an added bonus, he left me with a stack of Twins! 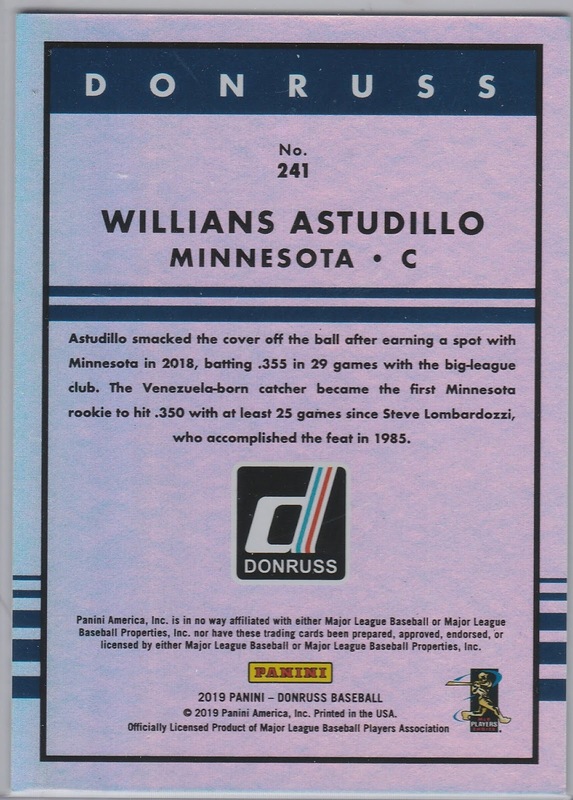 Why share a 1990 Topps card? 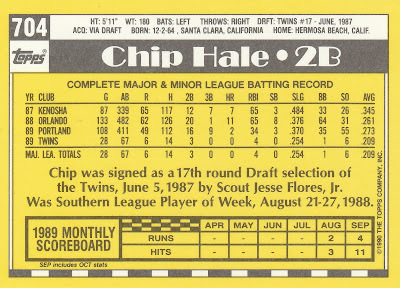 Well, it was a Topps Tiffany Chip Hale. 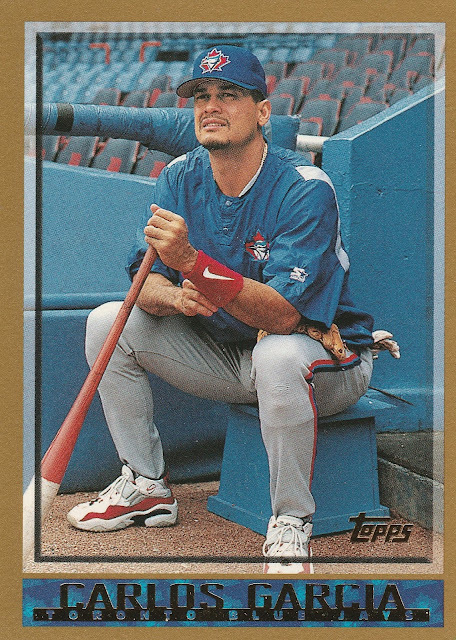 Rarest of the rare 1990 Topps cards. There were parallels galore - Twins might be missing Dozier's bat if Jonathan Schoop doesn't have that bounceback year they are hoping for. Byron Buxton is back in the starting lineup after a back injury that limited his appearances in the Philly series. Odorizzi had that bad start I mentioned earlier getting just two batters out on a cold and rainy night at Citizen's Bank Park. 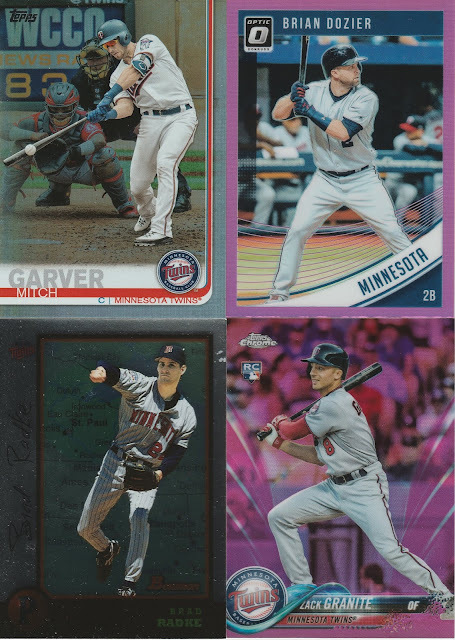 Good to see Torii showing up on some cards post retirement, too! 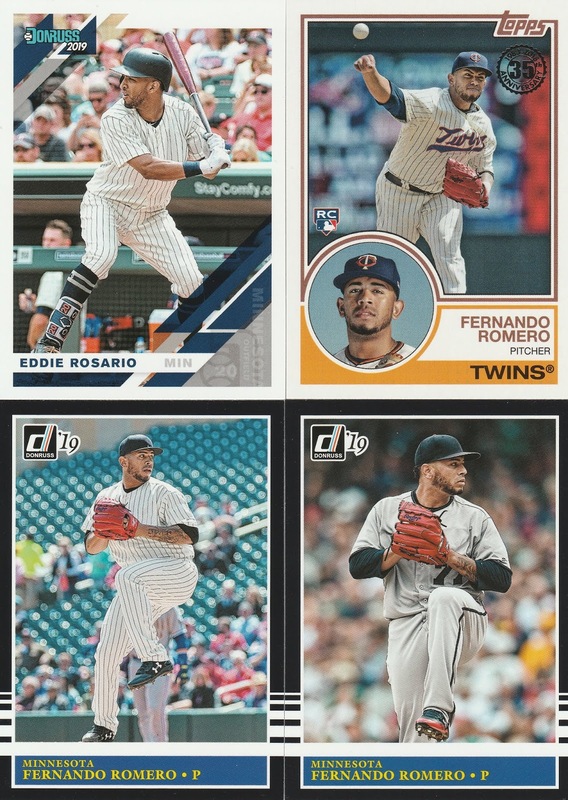 My favorite Twins pitching prospect is Fernando Romero - I was at the game on the left, at least I'm pretty sure that was his MLB debut against the Blue Jays. Both of those Donruss cards are Card # 207, though they are obviously different - the backs have different info on them as well. Donruss is strange. On to the sick hits! They only made 500 of this card. They only made 50 of this one! And it's a Twins-Friendly 34/50. 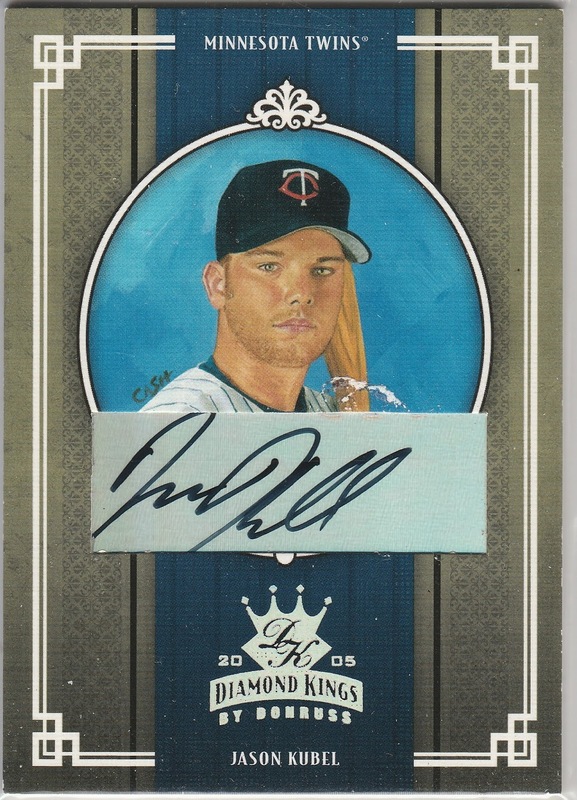 eBay Puckett one of one! 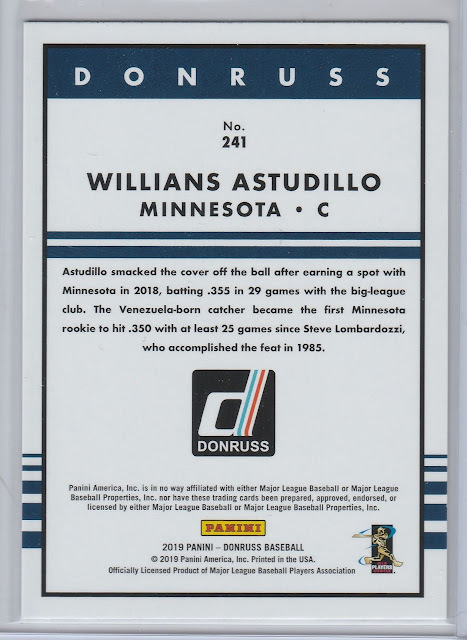 Topps probably made half a million of this card, but Willians Astudillo is one of a kind. Thanks for the cards, Jim! I will try to regain that magic and pull some great Dodger cards to send you real soon. 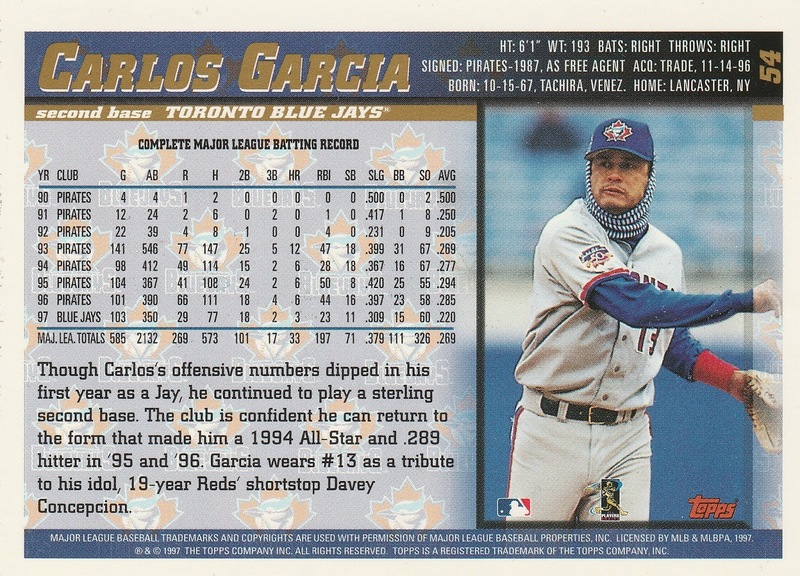 Carlos Garcia wasn't a superstar, but he was an All-Star. He took over for the recently traded Jose Lind as the Pirates' regular second baseman in 1993. 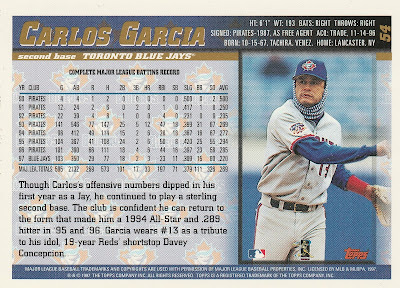 Garcia had languished for three seasons in AAA, blocked by both Lind and Jay Bell. 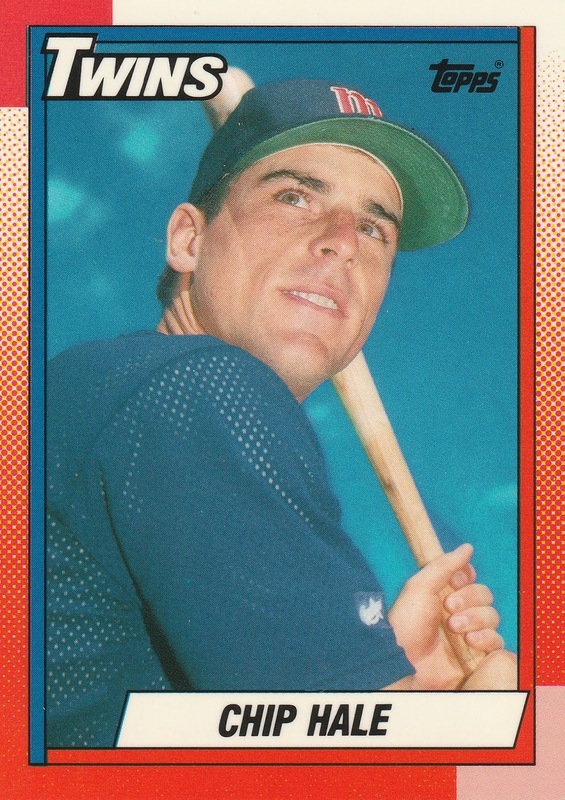 Garcia was a Short Stop in the minors, but would not be taking Jay Bell's place. 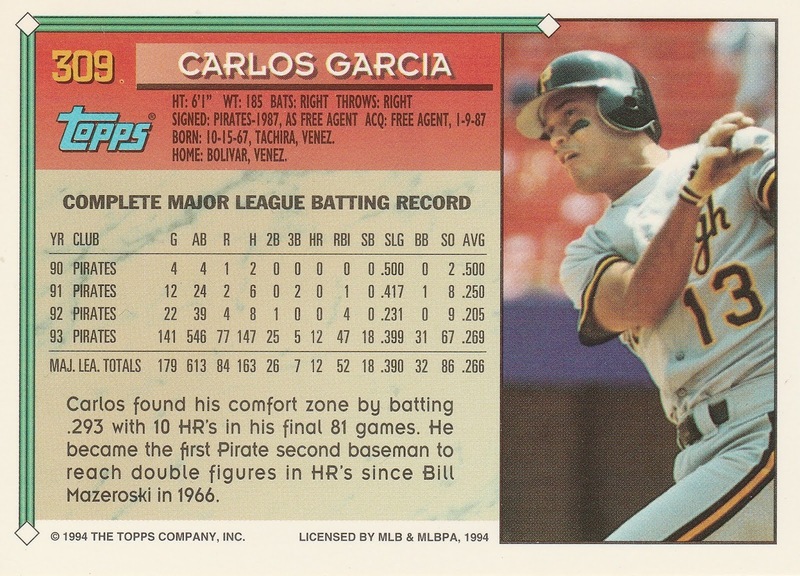 Garcia had 10 homers in 89, 10 in 1990 and 13 in 1992-- making his case to be a major leaguer for Pirates. 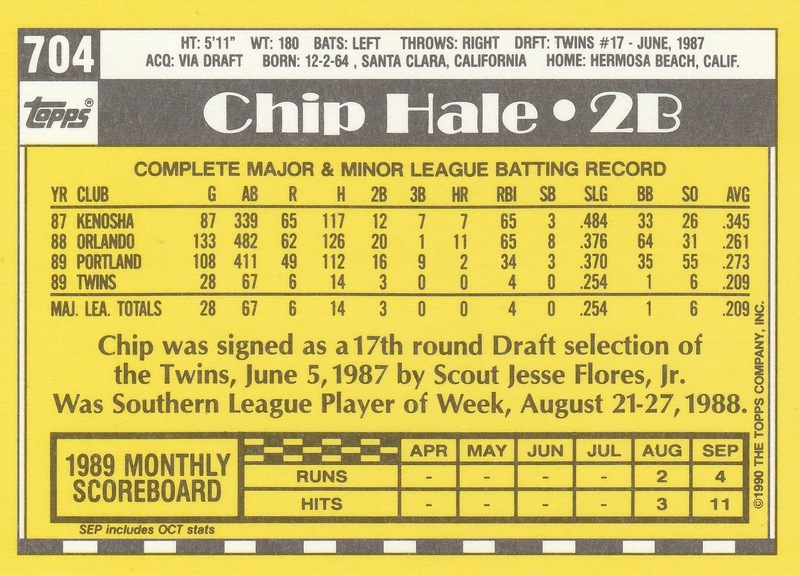 He would finish a distant 7th in the Rookie of the Year voting, but his 12 homers in 1993 were significant. The last Pirate Second Baseman to hit 10 or more homers? Bill Mazeroski in 1966! Things were looking pretty good for Carlos Garcia! 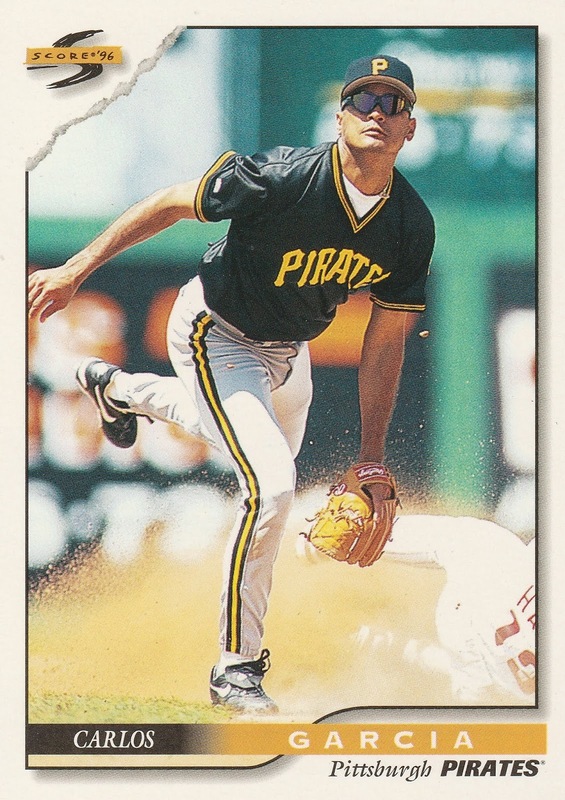 Following his Topps All-Star Rookie nod, he was the Pirates' lone representative for the 1994 All-Star Game, getting a base hit in his only at bat. 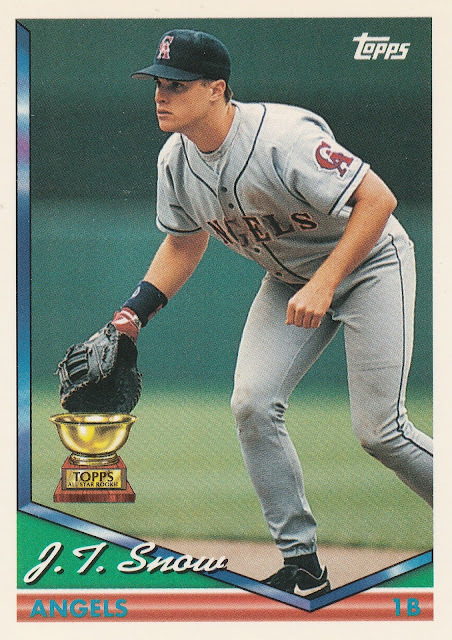 Take that, Tim Salmon! 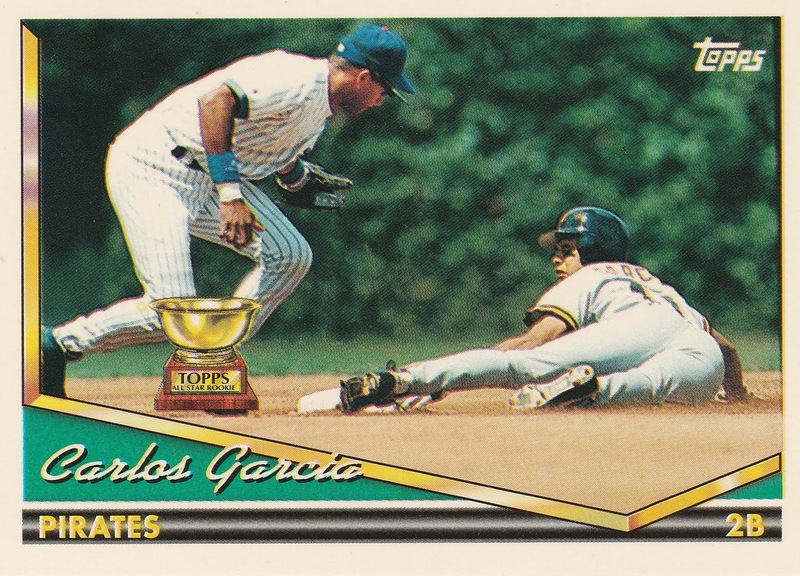 Garcia was the Pirates' regular starter at second through the 1996 season. 1993 ended being a career year for Carlos, with career highs in homers, hits, runs scored, doubles, triples, stolen bases... you get the picture. 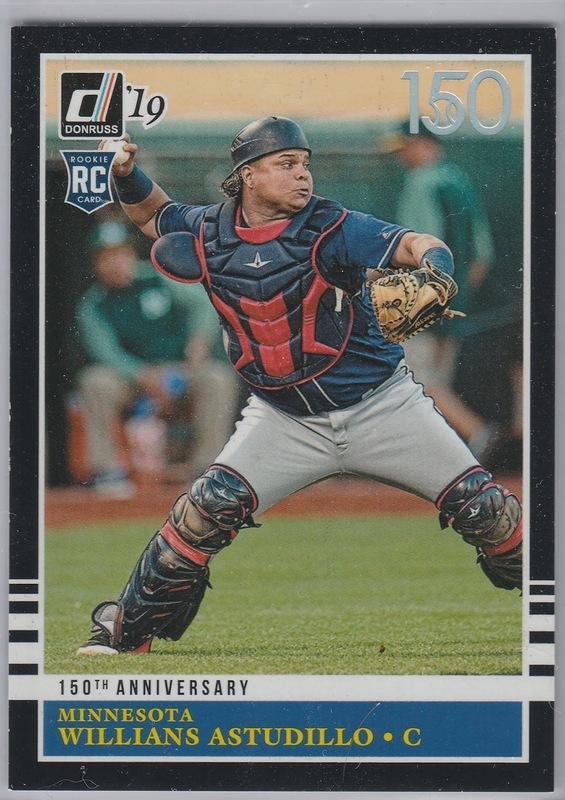 In 1995, he had a 21 game hitting streak and driving in a career high 50 runs. 1996 was his best year for batting average, hitting nearly .300 in his last season with the Pirates. His final Topps card came following his 1997 season in Toronto. 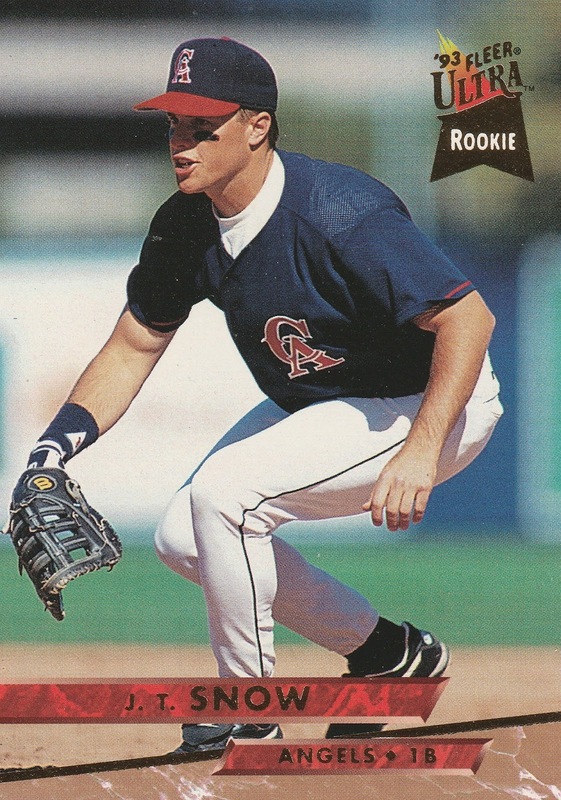 He'd go on to a season with the Angels and their AAA affiliate in 1998, then a season with the Padres and their AAA affiliate in 1999. He would play 2 more years for the Yankees' AAA team before hanging up the spikes. Looks cold in Toronto! Also cool - Garcia wore #13 in honor of Dave Concepcion, the long time Cincinnati Reds' player. 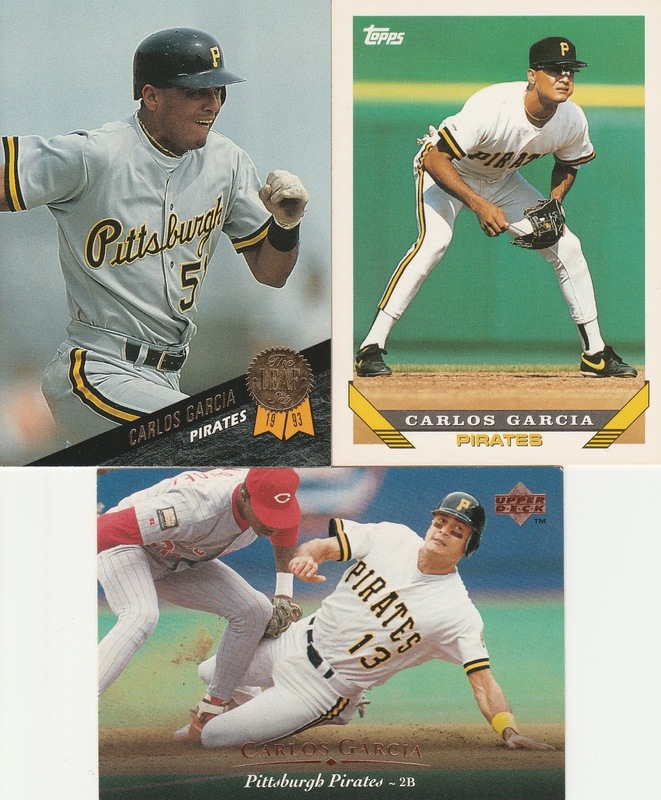 Following his playing career, Garcia went into coaching and found some success in the minors managing in the Pirates' organization. He managed the single A Bradenton team and two seasons for the AA Altona Curve. Last year he was managing in the Mexican League.